Back in 2009, I vaguely remember watching the first half-hour of the movie version of The Golden Compass. I obviously wasn’t all that impressed, since I didn’t keep watching it. I’m very glad that the movie didn’t turn me off the book, because the world Philip Pullman crafted is both familiar and strange in ways that are simply wonderful. There’s something very interesting about the world in which Lyra Belacqua lives. She’s an orphan living with the scholars of Jordan College in Oxford, running amok in the streets and rarely seeing her uncle, the intimidating Lord Asriel. Everyone has a dæmon — a creature they are born with and stays with them throughout life. Children’s dæmons shift shapes at will. Lyra’s Pantalaimon is her constant companion, shifting to a shape that’s most useful to her at the time. Science and religion in the His Dark Materials series are inextricably entwined. Church officials have their hands in almost everything at the frontiers of science, and scientific theories often contain theological ideas, concepts, and implications. I enjoyed the part of the book about Dust — some sort of elementary particle that is attracted to adults but not children — and how the idea of its existence at first made the Church persecute the man who discovered it. Once its existence was impossible to deny, however, they made their best attempt to fold it into their theology. Pullman does a good job of magnifying what actually goes on with religion and science today — science discovers and creates, religion denies and condemns, and then the two eventually come together. I thought it was an excellent concept to fold into a book whose target audience is children, since it’s a push and pull that shapes our current political, moral, and educational worlds. The Golden Compass is well-paced and plotted. Pullman is able to manipulate the reader into seeing things from a more child-like perspective, creating an extra layer of surprise within Lyra and the reader’s shared dismay over events. The best of literature aims for a connection to the reader on an emotional level, and Pullman manages to do this extraordinarily well. But the best part of The Golden Compass is Lyra herself. She’s the epitome of pluck — through changes in living arrangements, kidnappings, travel with an armored bear, and the appearance of a mysterious magical device, Lyra knows exactly what to do. She’s resourceful, strong, and (it’s going to sound weird to say this) an excellent liar. Her prevarications are almost always a better idea than telling the truth. More importantly, her less-than-honest ways are more believable than a perfect child. Lyra is not that, and will never be that. She is, however, a remarkable child. Remarkable is vastly superior to perfect, because perfect is boring. Lyra makes for an interesting read and an exciting story. Pullman’s His Dark Materials series has two more books in it, The Subtle Knife and The Amber Spyglass. They’re sitting on my shelf, and I’m thinking that I’ll be getting to them sooner rather than later. After all, there’s a scientific mystery to solve, theological questions to answer, and one girl’s story to follow up on. I think the first warning about A Discovery of Witches should have been that I heard about it in “Parade”. Now, there’s nothing wrong with “Parade”; I like to read it on Sundays as much as the next person does. But it’s not really known for being a reliable source for literary insight. I read their little blurb about this book, though, and I thought it sounded pretty good. Then my mother said she was getting it for my cousin for her birthday, and I thought it would be nice for us to have both read the same book around the same time. Unfortunately, I’m now in the awkward situation of knowing that my cousin’s going to get a book that is not spectacular, to say the least. 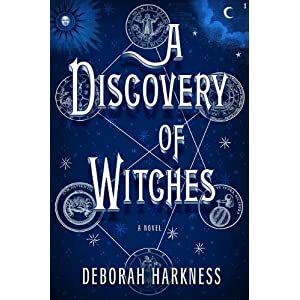 A Discovery of Witches starts off with our protagonist, Diana Bishop, establishing that she is a witch, but that she refuses to use her powers. She’s a researcher, interested in the history of science — in particular, alchemical manuscripts (so, really, she’s interested in the history of pre-science). She’s an American professor who’s younger than thirty, yet has earned a sabbatical year so she can study at Oxford. While looking at old alchemical texts, she notices that one is enchanted. She manages to open it, pretty much ignores what’s inside, and returns it. After that, all hell breaks loose, and “creatures” (Harkness’ term for daemons, vampires, and witches) come out of the woodwork to threaten Diana in all manners of ways. But this is all okay, because she quickly runs into Matthew Clairmont, a vampire on a mission to protect her. Then Harkness spends four hundred pages ruining the premise she set up in the first thirty by making Diana completely dependent on Matthew for her physical safety and personal well-being. He does everything from guard her from other creatures to making sure she does yoga. This is extremely irritating. Don’t create a character that you call strong and brave and then have her be completely clueless as to how she’s supposed to behave without a man to reference. I will say that Harkness’ writing flows well. I found it a pleasant read, language-wise, and would love to read something that isn’t so pseudo-feminist and, frankly, insulting to independent, strong women. I’d love for her to either write something that doesn’t involve a strong romantic theme or, conversely, something that is open about the fact that it’s a romance and embraces the genre. At least then the work would be honest. One of the worst things an author can do is lie to the reader within the book’s own text. I feel disrespected and betrayed, and feel almost that I should give my copy back to my mother so she can return it and recoup her money. As it stands, however, A Discovery of Witches falls flat for me. It doesn’t even end satisfactorily; planning on two more books to come, Harkness made this one end in a cliffhanger. Sadly, this is just another turn-off for me, and I won’t be seeking out Diana and Matthew for another go-around. Unless my mother buys me the sequel. Then I’ll be duty-bound to read it, and most likely much more grumpy for the return trip.